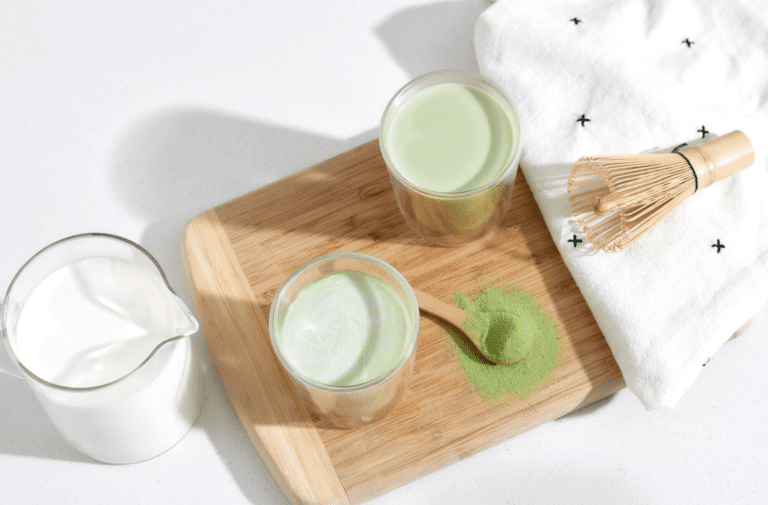 Amplify your morning with this cozy and collagen-packed matcha latte from yoga teacher and Instagram icon Caley Alyssa. If you’re caught up on all things nutrition, chances are you’ve heard about collagen. From nutrition experts advocating for the benefits of sipping on warm bone broth, to beauty editors praising the nutrient for its ability to improve skin elasticity and strengthen hair and nails—it seems that collagen is an all-around miracle worker. But what exactly is this trendy new superfood, and why is it so awesome? Collagen is an essential protein that exists naturally in the body and is made up of a number of amino acids including glycine, arginine, hydroxyproline, and proline. It essentially acts as the connective tissue for our bones, hair, skin, nails, ligaments, and tendons—i.e., it keeps us moving, grooving, and looking fresh. When we get older, stressors on the body can stall or break down our natural ability to produce collagen. Therefore, it’s important to supplement collagen in our diets in order to make up for what has been lost. Luckily, there are loads of simple and delicious ways to incorporate collagen into our everyday lives. Yoga teacher and wellness guru Caley Alyssa recommends starting each day with a nourishing matcha collagen blend. In addition to collagen’s noticeable effects on skin’s elasticity and natural glow, the protein also allows our bodies to function more efficiently. As yogis (and also just as human beings), healthy muscles and ligaments are vital for leading a full, healthy lifestyle. Repetitive activities can cause strain on the body and break down collagen. Supplementing with collagen consumption aids in joint recovery, builds muscle, burns fat, and aids in digestive health. Vital Proteins’ mission statement sums it up best, saying “your body shouldn’t be a limitation, but a catalyst.” So get out there and be the brightest you you can be. Dissolve Vital Proteins Matcha Collagen into hot water. Gradually add warmed milk, stirring until the matcha is fully dissolved. Add matcha mixture, butter or coconut oil, honey, and jing blend (if using) into a blender, and blend on low speed until frothy. Alternatively, stir all ingredients together and froth with a milk frother or hand mixer. Pour into the mug of your choice and enjoy!